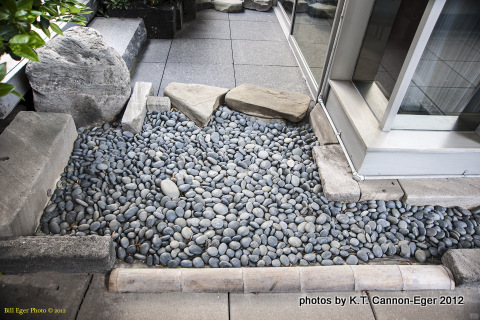 Placement of the stones in the Japanese garden at the Golden Gate International Exposition on Treasure Island was designed by Kaneji Domoto, who later oversaw moving the stones to UC Berkeley for the Japanese pond in the botanic garden. 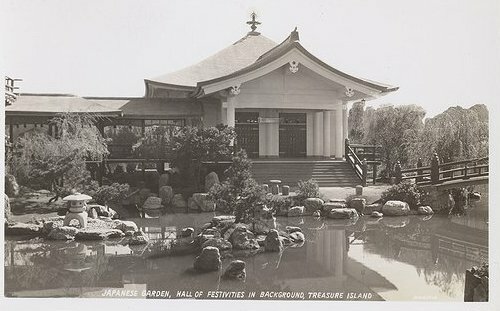 (Photo reproduced courtesy of the Japanese American National Museum in Los Angeles, donated by Francis and Gloria Massimo) The Exposition was held in 1939, the same year Domoto worked on another garden in New York for an exposition there. Kaneji (known as Kan) Domoto was born on November 5, 1913 in Oakland California, the eighth of eleven children. 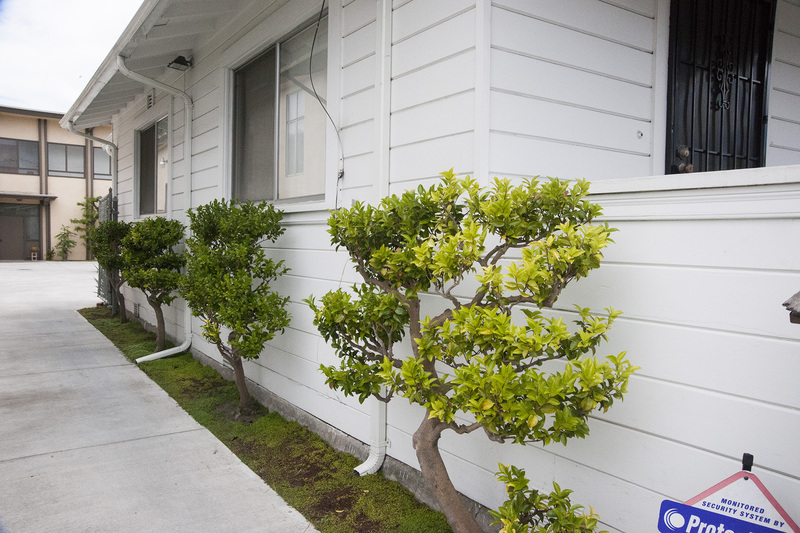 At the family nursery in Hayward, he learned to propagate camellias and peonies for which his nurseryman father had become famous. “Domoto attended Stanford University studying science and physics, and played on the soccer team. 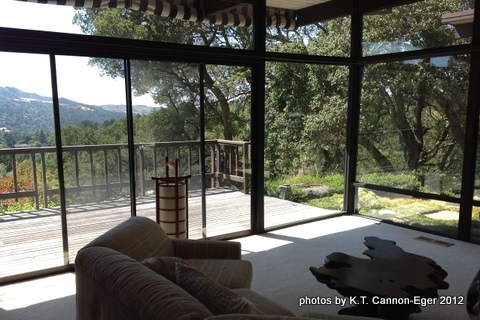 He also studied landscape architecture at the University of California in Berkeley. With the advent of World War II, Domoto was interned with his wife, Sally Fujii, at Granada War Relocation Center [also known as Camp Amache] Colorado. 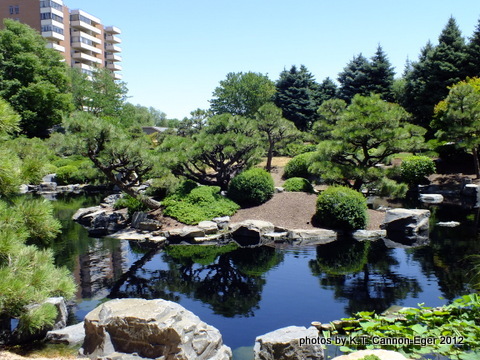 At the end of the war, they moved to New Rochelle, NY with their children, Mikiko and Anyo. Later two more children, Katherine and Kristine, were born in New Rochelle, NY, where he made his home for many years. Domoto died January 27, 2002. 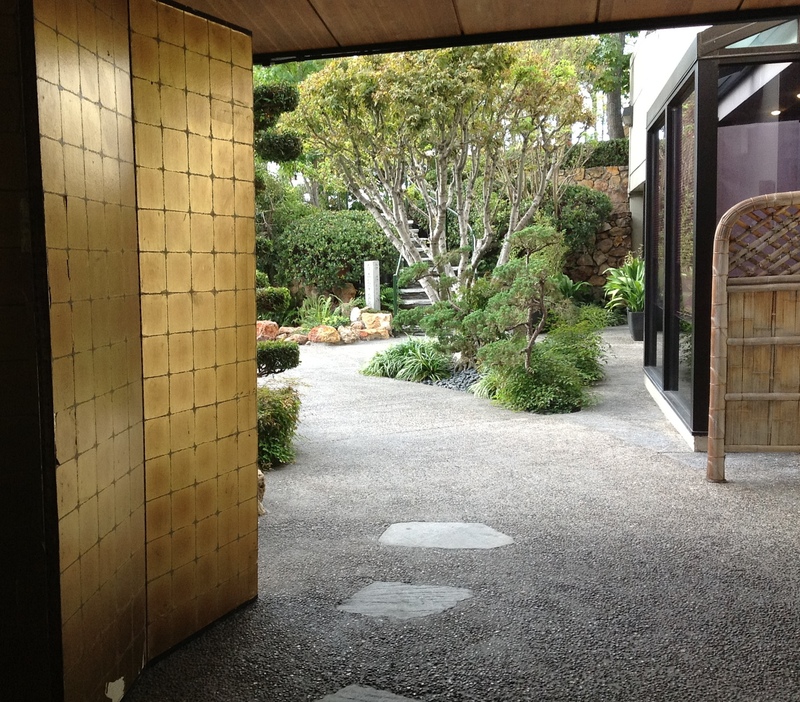 “Domoto had a long and productive career in architecture and landscape design. He designed several homes at the famous Frank Lloyd Wright Usonia homes development at Pleasantville, NY. He designed landscapes for residential and commercial projects, mainly in Westchester County but also in surrounding northeastern states. 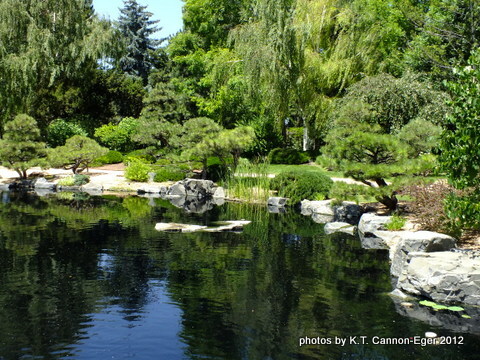 He became noted for his use of huge stones and rocks in his well-known Japanese-American gardens at the New York World’s Fair Japanese Exhibit, in Berkeley, California, Jackson Park, Chicago, and Columbus, Ohio. 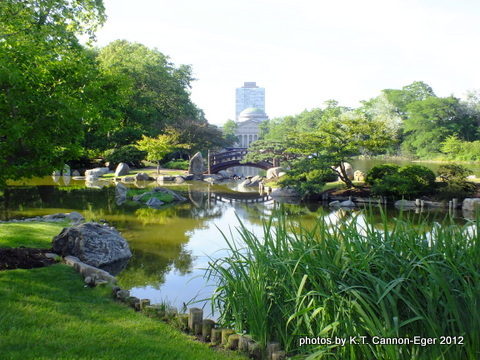 “His career produced more than 700 projects, and Domoto received many awards for his work, including the Frederick Law Olmsted Award for his Jackson Park design. He donated many hours to local and national civic associations throughout his career. The Golden Gate International Exposition on Treasure Island celebrated the opening of the San Francisco-Oakland Bay (Bay Bridge) Bridge in 1936, as well as the opening of the Golden Gate Bridge in 1937. Domoto also published a book on bonsai. 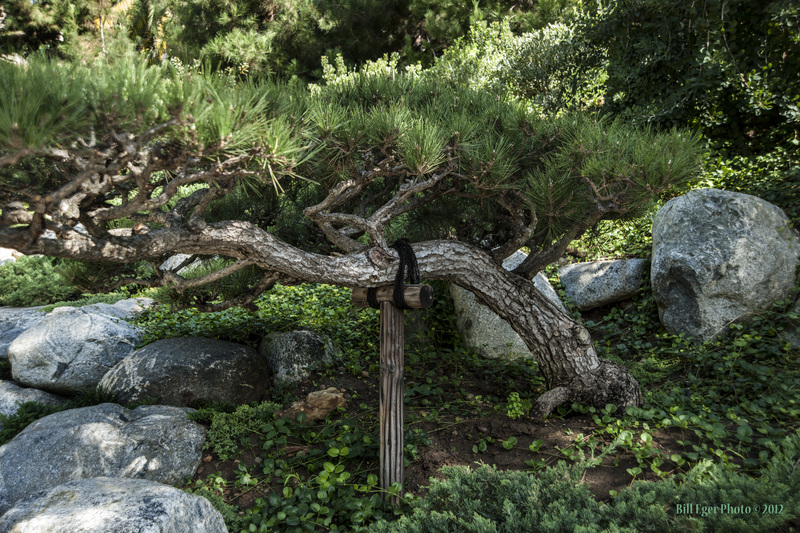 His brother Toichi Domoto remained in California with the nursery business and is featured in oral histories in the UC-Berkeley collection on the growth of the California landscape industry. 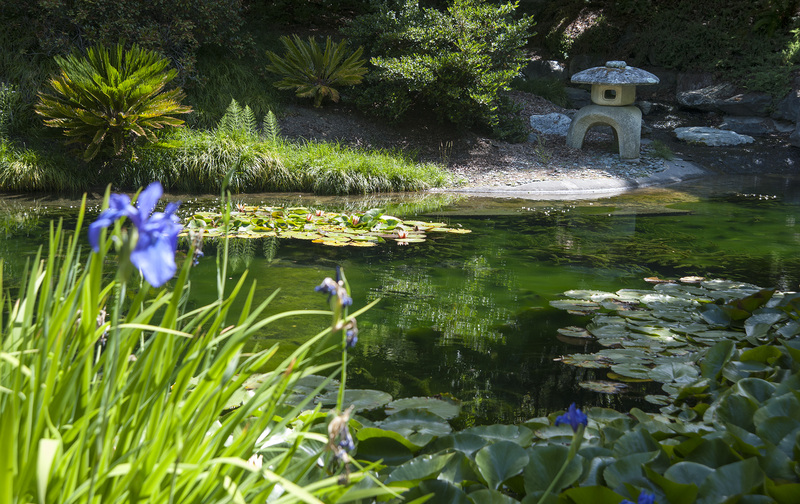 The area of the Japanese pond in the botanic garden on campus is known as Strawberry Creek. According to director Paul Licht, the area was a dairy before becoming a pond. 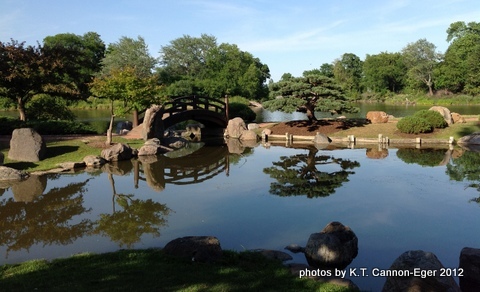 Work on the Japanese garden began in November 1941. 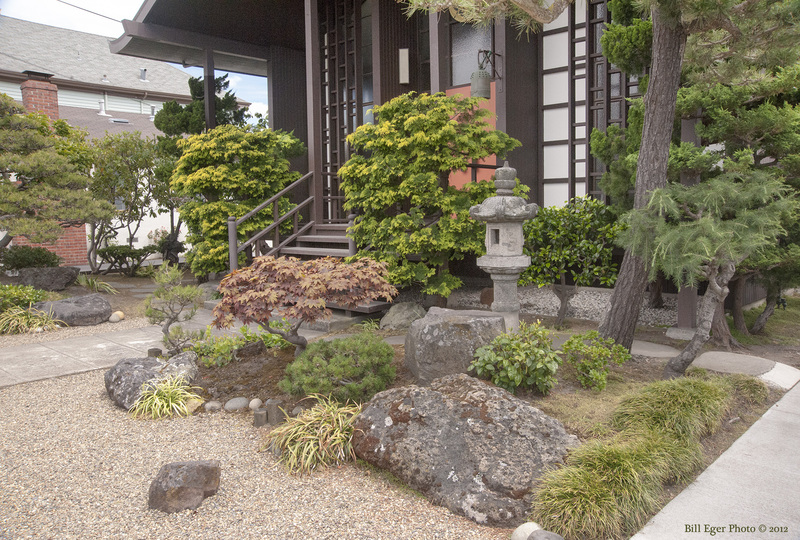 Immediately after Pearl Harbor, the stones and lantern were moved to a warehouse for safekeeping and the garden was not completed until after the war ended. 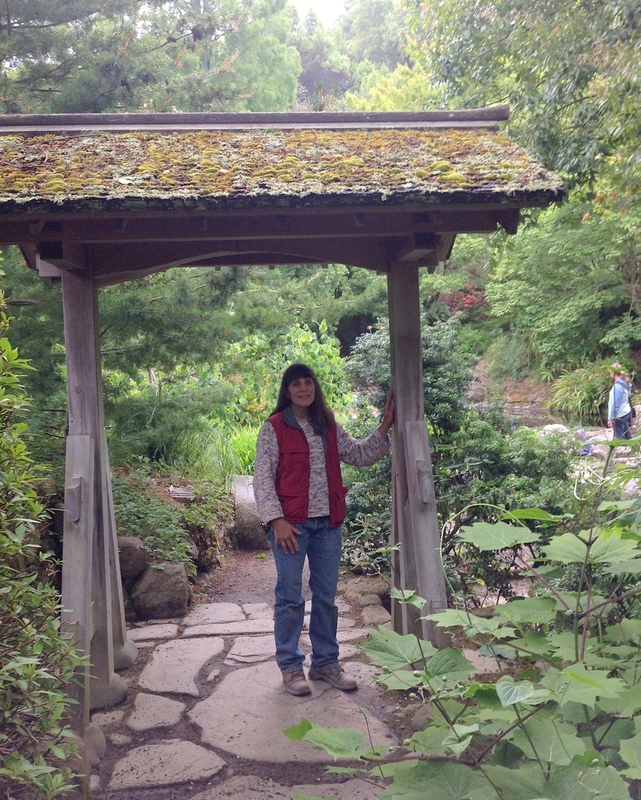 Elaine Sedlack shows the donated gate at the UC-Berkeley pathway to the Japanese pond. Sedlack laid the pathway stones that go through the gate built by Paul Biscoe. Retaining wall stone masonry was by Shigeru Namba. 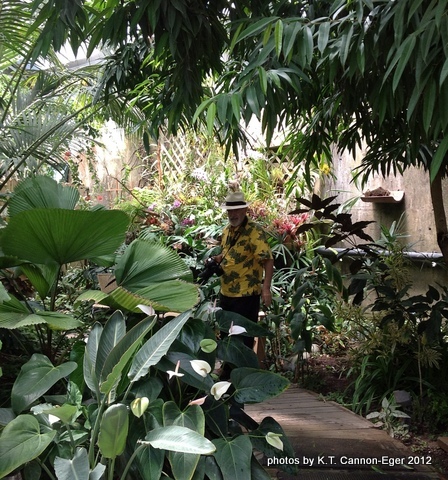 Curator Elaine Sedlack has gardened since 1969 and has been with the Asian collection since 1984. 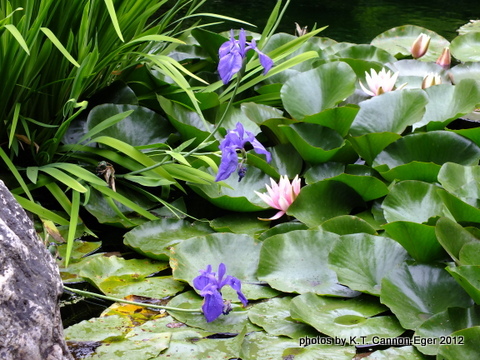 She is active in international plant societies including maples and rhododendrons. Sedlack noted that a flood in 1965 brought a lot of mud down the slope and that the lantern was damaged at that time. Over the years, many improvements and additions have been made. 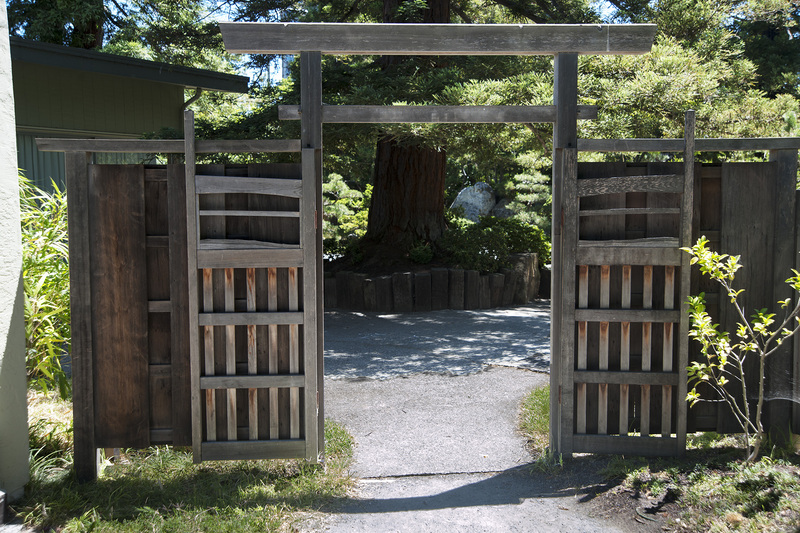 Shigeru Namba, a stone mason from Osaka living in California, built retaining walls around the gate built by woodworker Paul Biscoe. 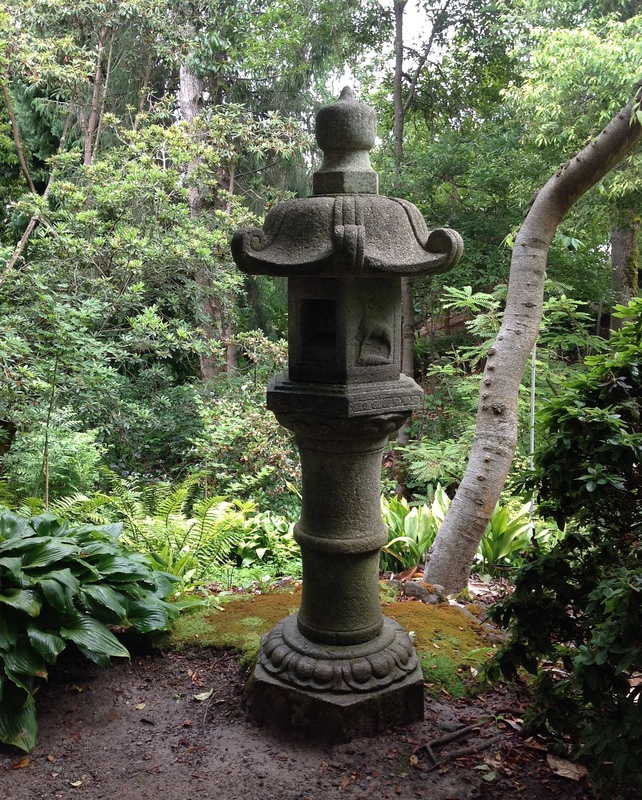 Namba, his wife Sakiko and their two year old daughter drove in from Woodside to set a lantern obtained in Japan by landscape architect Ron Herman. 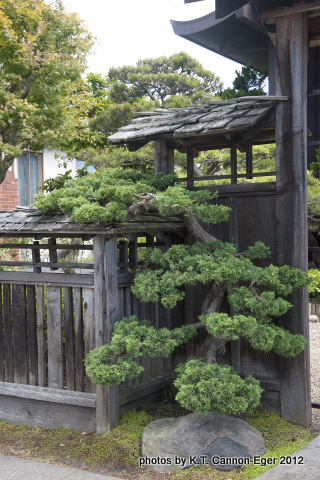 The gate and the lantern honor the involvement of two stalwarts of Berkeley’s Japanese-American community: artist Chiura Obata and ikebana teacher Haruko Obata, his wife. 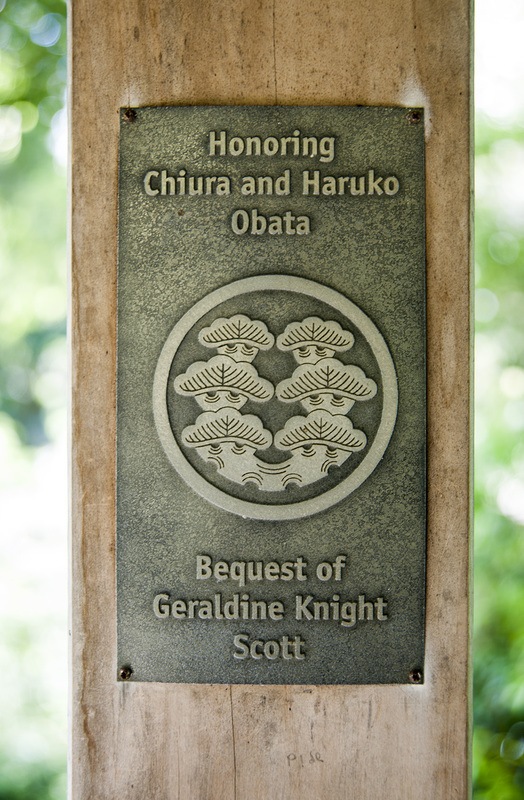 The lantern is dedicated to Haruko Obata for her contributions to the art of flower arranging. As early as the 1915 exposition in San Francisco, her work was important enough to warrant an entire room for display. Chiura Obata (1885-1975) was born in Japan and came to California in 1903. A master in the traditional Japanese sumi ink and brush technique, he also excelled in art education and taught at the University of California, Berkeley from 1932 until 1954, except for the years of internment. Many works were published in the book Obata’s Yosemite (Yosemite Association, 1993). 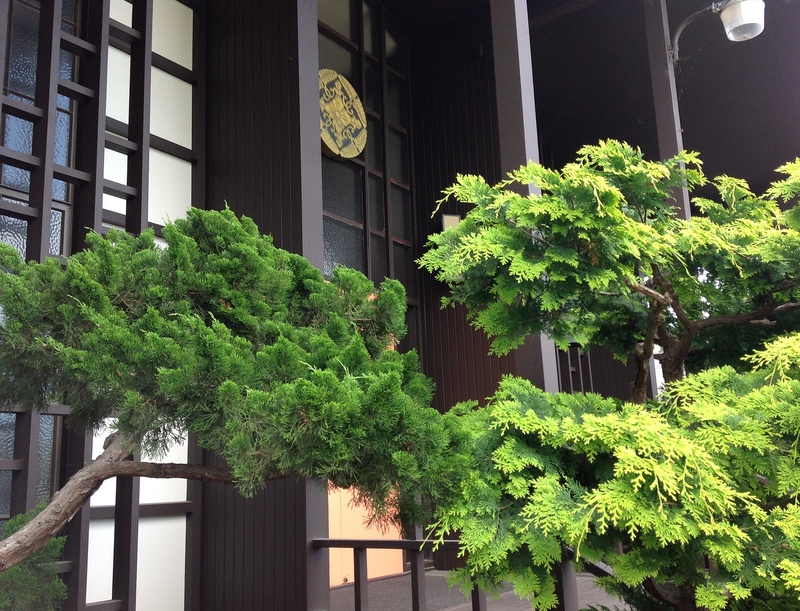 In 1932, Obata began his teaching career at the University of California. For watercolor painting, he gave his students the traditional Japanese materials: the brush, ink of pine soot, colors from vegetable and mineral pigments, and silk and paper as media. In 1938, Time magazine called Obata “one of the most accomplished artists in the West.” Known for defining the nihonga style of painting—a technique that blends Japanese traditional ink painting with Western methods—Obata influenced a generation of artists who were part of the California Watercolor Movement in the 1920s and ’30s. His popular classes were interrupted by evacuation first to Tanforan and then to Topaz internment camp in Utah in 1942. Even under these conditions, Obata painted prolifically and organized art schools in the camps with as many as 650 students from the internees. His granddaughter Kimi Kodani Hill notes, “His experience of knowing nature consoled and inspired him,” Hill says. “He always told his students at the camp ‘don’t just look at the dust on the ground, look beyond.’” Hill is editor of Topaz Moon: Chiura Obata’s Art of the Internment, with an introduction by Timothy Anglin Burgard and foreword by Ruth Asawa. 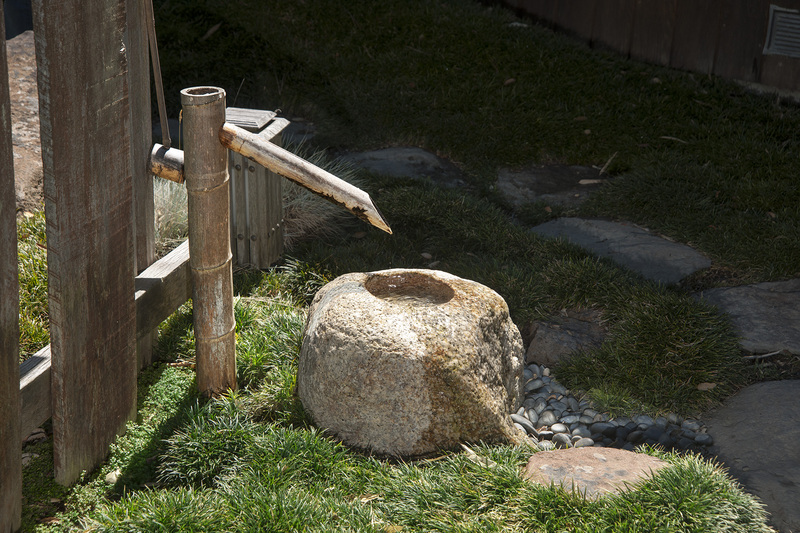 Smithsonian exhibit, A More Perfect Union: Japanese Americans and the U.S. Constitution: “All the families did some gardening about their dwellings in order to beautify them. 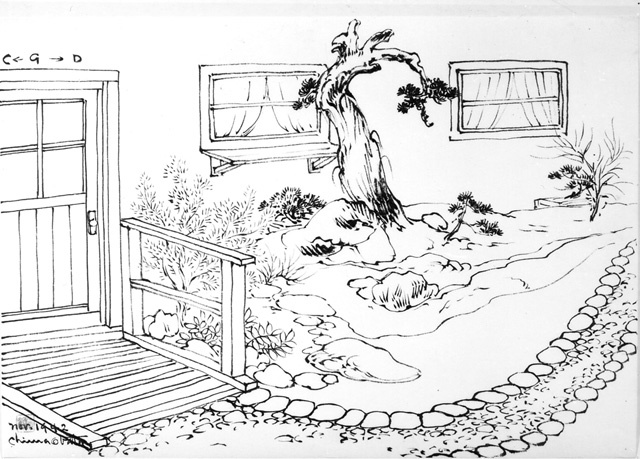 Everything had to be brought in from the mountains, rocks, trees and shrubs.” Chiura Obata about the garden outside the family quarters at Topaz; illustration used with permission from the family. He returned to the University of California in 1945 and resumed his faculty position. Former University President Gordon Sproul and several students had kept many artworks safe during the war and returned them to Obata. He traveled extensively as he lectured, sketched, painted, and gave one-man exhibitions at major galleries and museums. In 1965, Obata received the Kungoto Zuihosho Medal, an Imperial honor and accolade, for promoting goodwill and understanding between the United States and Japan. From 1954 to 1972 Obata was a tour director, taking Americans on regular visits to renowned gardens, temples, and art treasures in Japan. Students continued to gather at his Berkeley home on Ellsworth Avenue to study painting. 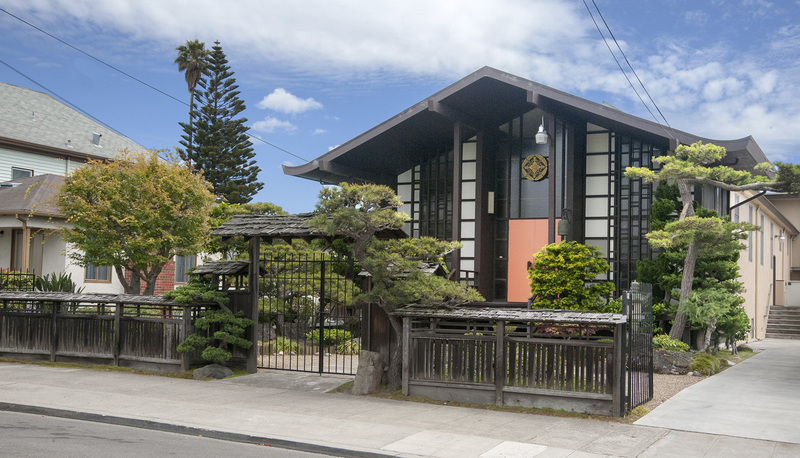 Their studio on Telegraph Avenue was voted a landmark in 2009 by the Berkeley Landmarks Preservation Commission. 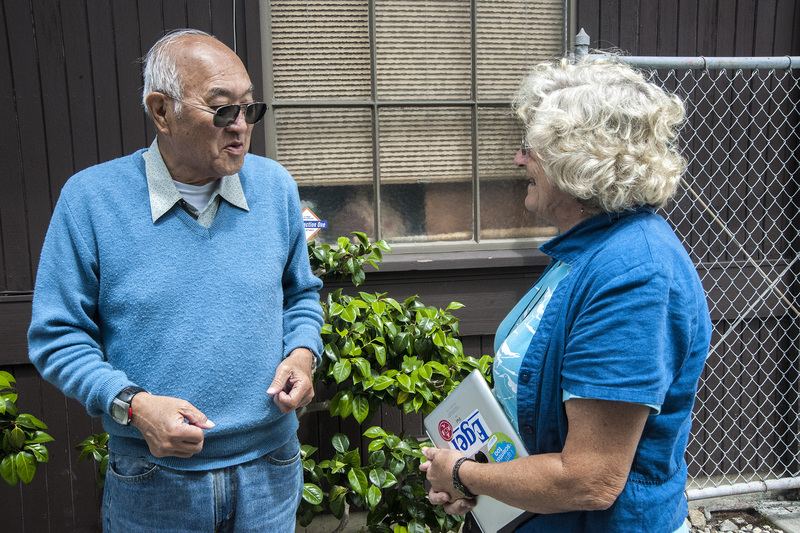 Graves heads Preserving California’s Japantowns, a statewide survey of pre-World War II Japanese-American historic resources. Funded by the California State Libraries, the project has identified hundreds of locations in nearly 50 cities from San Diego to Marysville. To see any photo in this article full size, click on the image. 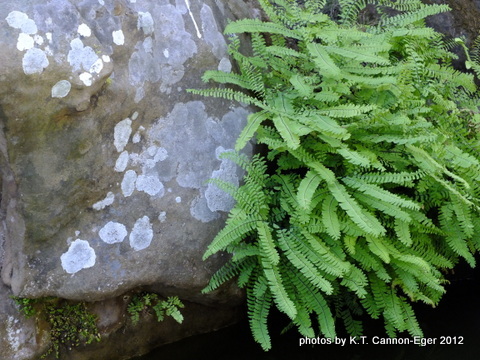 Unless otherwise noted in captions, photos are by K.T. Cannon-Eger. Please be nice and do not copy without permission and attribution. Comments are welcome. All comments will be read and approved before they appear. Still writing when I should be packing … we’re off on another adventure to visit gardens, this time on the east coast. But I am three states and several gardens behind in posting where we have been! So here is a little preview of what is yet to be posted. Now to that packing! Elaine shows the donated gate at the UC-Berkeley pathway to the Japanese pond. 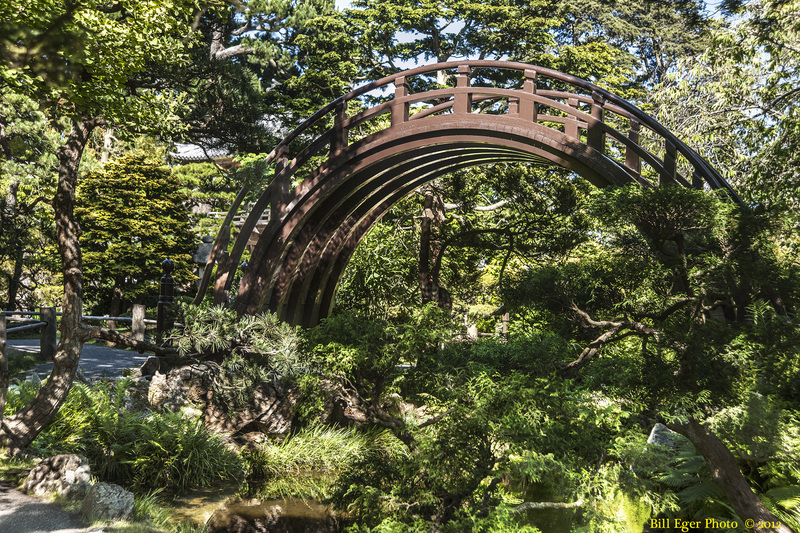 The Japanese Tea Garden in San Francisco’s Golden Gate Park dates back to 1894. 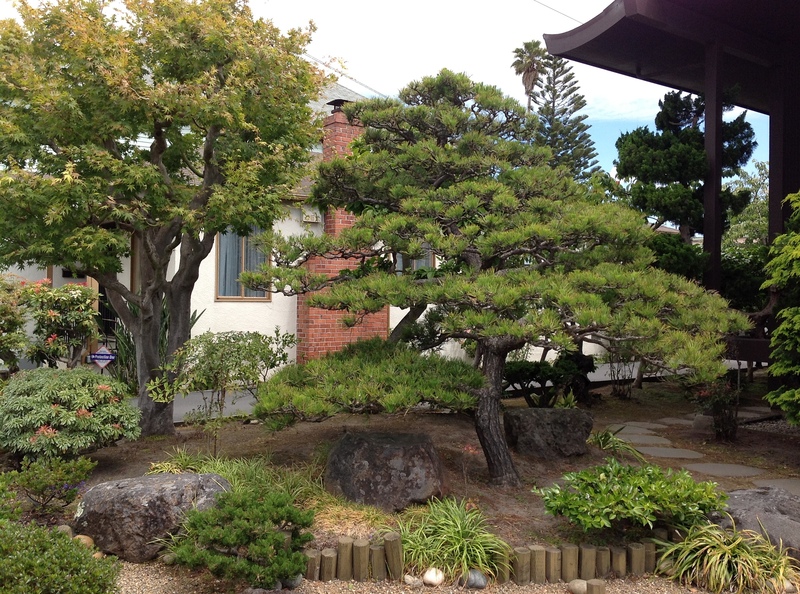 The Japanese Friendship Garden at San Diego’s Balboa Park is completing expansion work to be ready for the park’s centennial in 2015. 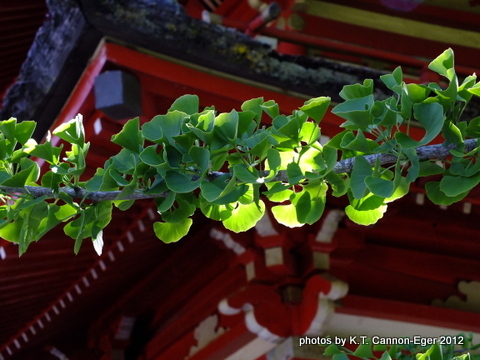 Any photographs not otherwise credited are by K.T. Cannon-Eger. If you borrow, be nice and give credit. Comments are welcome on this and other posts in this blog.